Bennington G.A.R. Links MOLLUS Monuments National Homes Pensions Resources Reunions State Homes Veterans Day W.R.C. Post-war Organizations, Events and Places. By the latter part of the nineteenth century many of our Union veterans of the Civil War were aging, sickly and feeble, both physically and mentally. Coming home from the war ravaged south, thousands suffered from the trauma of battle, many with injuries they endured the effects of the rest of their lives, as well as the seeds of disease, which festered over time, and took a toll on them. Many had family, a spouse, or children on which to depend. Many did not, some became too much to care for in a family environment and were unable to care for themselves, and therefore were placed in the towns poor houses. Many died neglected and alone, given a pauper's grave, unmarked, and location known only to God. This became an emotional issue with many veterans that were fortunate to return from the horrors of war, basically unscathed, and able to join the mainstream of life, and become productive and concerned citizens. Their comrades, that didn't, and were in such despair, were the focus of their energy for many years. For several years there had been talk concerning the building of a soldier's home in Vermont. This had been met with some resistance; some believing it wasn't needed, as families could care for their veteran, some felt the expense would be too great, and many were against the chance that our faithful soldiers would become institutionalized, and deprived of their dignity and worth. In 1884 a group of public spirited gentleman, a majority veterans themselves, gathered to approach the state' government as to the feasibility of such an idea. By November of that year an Act of Incorporation was enacted by the General Assembly, naming the ones making the request as trustees. Soon after, they elected Ex- Vermont Governor, Redfield Proctor, as chairman, and the Legislature appropriated the sum of ten thousand dollars. Charles C. Kinsman: Served in 4th Vt., Co.
Alvin B. Franklin: Lieut.-Col. 8th Vt.
Hugh Henry: Q.M. Sergt. 6th Vt. Co. I.
John C. Stearns: Adj. 9th Vt. Cav. Josiah Grout: Maj. Of Frontier Cav.in 1st and 2nd companies. Horace K. Ides, Lieut., 1st Cav. Regiment Do. D.
William Wells: Brevet Maj. Gen., 1st Vt. Cav. Warren Gibbs: 1st Reg., Cav. POW, transferred to VRC. Z. M. Mansure: 10th Reg., Co. K. Wounded, discharged for wounds. Frank Kenfield: Captain, Co. E, 13th Vt., Co. C. 17th Vt. The first order of business for the organized committee was to establish by-laws and explore possible locations, within the state, to purchase or build such a home. A circular was sent to each town in Vermont, to be published in local papers requesting opinions and suggestions. This was received with enthusiastic response. Several towns were interested in housing a soldiers home, including Randolph, Norwich, St. Johnsbury, Newport, and Bennington. A sub-committee of four was elected to explore all options, and report back as to their judgment. At the same time another request of additional funds was presented to the Legislature, which was honored. 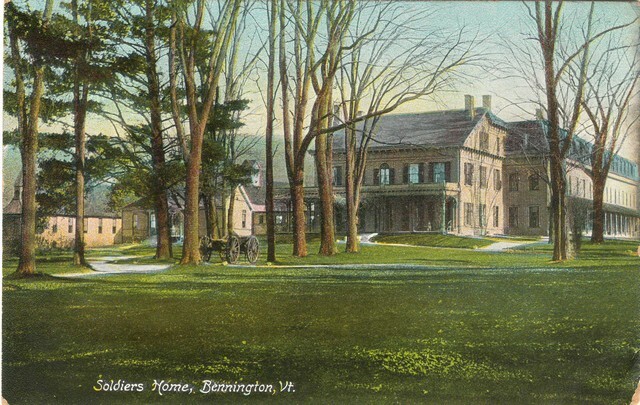 Much time and energy was put into this effort, and within a year the decision was made to establish the home in Bennington. The location in Bennington was a bit too good to be refused. The offering was a two hundred acre estate, established by a prominent business man, Seth B. Hunt, as a summer home for him and his family. The home itself was elaborately built, with several out buildings, a well-stocked and working farm, 170 acres of woodland, ten acres of cultivated land, with the remainder lawn. No expense was spared and it was truly a beautiful and serene plot in the area of North Bennington. At Hunt's death his widow sold the property to Trenor Park, a close associate of Hunts. Park had plans to establish a home for aged widows, and children in need. This never materialized, as Mr. Park died very suddenly and unexpected, leaving the property to the trustees of his estate. It was through this estate the well-established property was offered as a site for the soldiers home, which seemed made to order, and gladly accepted. In December of 1886 there was a meeting of the trustees, where they received the deed for the property, submitted a request for more support from the legislature, and appointed Colonel Robert Coffey and Mrs. Coffey of Windsor as Superintendent and Matron of the Home. Col. Coffey was a member of Company K, 4th Vermont, and was awarded the Medal of Honor for distinguished conduct at the Battle of Gettysburg. Following the war the Colonel was the landlord of several hotels, and seemed much fitted for the task he was appointed to do. The Coffey's took up residency at the Home on April 1, 1887 to prepare for the admittance of the soldiers whose applications had been previously accepted. Although the buildings, including the Home itself, were in exceptional condition, they needed a well-stocked kitchen, linen and other household supplies, more beds, medical supplies, and certainly some cosmetic work to make it appropriate and appealing for an all-male population. On May 18th the doors opened to greet the new inmates (usually termed as such during the period, but will refer to residents herein after). The first resident to be accepted was George E. Wood of Randolph, a member of Company E. 2nd Regiment Infantry. He maintained his life at the Home until his death in 1899.Following the admission of Mr. Wood twenty four other Union veterans were accepted, and this filled the Home to capacity, and created very cramped quarters. There were still many applicants waiting for admittance. It became very evident more room was needed. By the fall of 1887 real progress had begun, and continued well into the 20th century, with new structures to increase sleeping quarters, as well as living, hospital, dining, laundry, library, as well as a chapel being constructed. Although the State of Vermont was the mainstay of the Home( along with some federal assistance), it must be recognized, that from the very beginning, various organizations and individuals showed untold generosity in their support of the Home. Several G.A.R. Post throughout the state, with the help of the Woman's Relief Corps, and Sons of Union Veterans, were instrumental in seeing that all sleeping rooms were furnished for comfort, including details such as laundry bags, quilts, mirrors, brush holders, and framed war sketches. Most prominent with donations were: Custer Post of Bennington, Roberts Post of Rutland, Stannard Post of Burlington, Gen. William Wells Camp of Burlington, Col. Tyler Camp of Brattleboro; Sons of Veterans and Woman's Relief Corps of Windsor, Montpelier, St. Albans, Brattleboro, St. Johnsbury, Chester, and Bradford. Individual donations came from Mr. W.E. Hawks of Bennington, and Mr. T.J. Deavitt of Montpelier and a thousand piece red, white, and blue bed quilt made by the E.B. Frost Woman's Relief Corps of Post Mills. The grandest achievement of The Grand Army of the Republic was raising one hundred percent of the required amount to build a chapel on the grounds of the Home. In its time it was the only building of its kind funded, erected and furnished without any state or federal funds, and was constructed to seat two hundred people. In 1888 young Sunday School children donated twenty- five Bibles to the home. Eventually, through various civic groups, every resident had his own Bible. 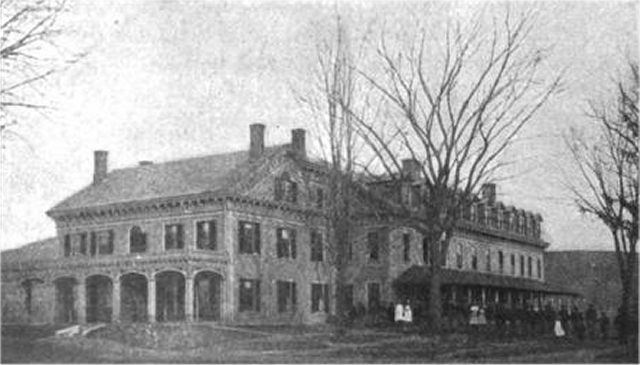 Although it was stressed, by the trustees and management alike, the Vermont Soldiers Home would never resemble an institution or asylum, as its intent was to be a home of peace and comfort, there were house rules. No rules were unreasonable, and no more than would be a part of family living; keep self and room clean, smoking only in a room provided for such, no foul language, no disrespect shown to administration and fellow comrades, and no alcoholic beverages. Any breach of house rules could result in a discharge from the Home. The smoking room was the gathering point of many "Old Soldiers", and here one can imagine the exchange of memories of the war, with relived stories, both happy and sad, some causing sadness, others bringing laughter. The room was furnished with much reading material; daily papers, periodicals, and books. There were playing cards and games. Dominos and cribbage were popular entertainment. Of course, the Matron made sure there was always a fresh tin of tobacco for added pleasure. In the earliest days of the home no resident was required to do any work, unless he felt the want. Some old timers, farmers, or a farmer's son, would find his way to the barns and gardens to help do what their youthful rearing had taught them. Others would putt around the Home, and assist in household chores. Later on requirements were instituted, and if able, a resident would be assigned to a chore that he was capable of doing. Eventually some positions became a paid chore. No soldier was admitted to the Home unless his war pension was $12.00, or less, per month (This amount was gradually increased over time), unless his situation warranted it. Of the pension amount the resident received $1.00 for himself, another dollar was reserved for him should he have a furlough, or chose to leave the Home. If the resident had a wife or young children at home the wife could apply for the balance, or if not, it would stay at the home for soldiers care. The Soldiers Home was inspected thoroughly, and frequently. Visitors were always welcome, the media of the time reporting often to the findings. Nothing was ever found to give question as to the operation of the establishment, or to the comfort and care of its residents An overview of the Home showed it was doing as it was intended to do, making a home away from home for our heroes who gave so much in defense of our Union. However, it is reasonable to believe that any situation where a hundred or more residents share common space, with varying degrees of intellect, background, likes and dislikes, and various health conditions, there is likely the possibility of conflicts, whether it be, personality, politics, religion, what's mine/what's yours, war events, or any number of things. In early January of 1912 a 68 year old soldier, Henry Camp, originally of Bennington, and Alexander Freeman age 78, originally of Hinesburg, crossed the line on acceptable behavior, and clashed violently, to the point of needing physical separation. The following morning they awoke, and immediately continued their fracas. Before they could be successfully separated this time, the punches became deadly. Freeman was taken to a local hospital where he died, evidently from internal injuries. Although this was a very definite infraction of house rules, no disciplinary action against Camp could be found. At the most, he may have been expelled for a period of time, and later readmitted. His death occurred at the Home on April 27, 1924. As in today's weekly town publications, many newspapers throughout the state would print tidbits regarding the Home, or its residents. Most were not detailed, and only offered a fact clear enough to tell the story of sadness or despair. They were all echoes of post-traumatic stress, and the veterans' lack of will to continue on. Such was the case with John Clifford, an original citizen of Charlotte. Clifford came to the Home in 1889. Most of his two years of residency there he was hospitalized and treated for "head difficulty." He had enlisted with Company K of the 11th Vermont in the summer of 1862, Early in his enlistment he deserted for a month, but returned, accepted, only to be discharged in the spring of 1863 for a disability. A few days before the New year of 1891 rang in, Comrade Clifford leaped from the dining table, latched on to a bottle of prussic acid from a medicine cart, and consumed it before he could be stopped. In his death it was reported he had no relatives. His remains were placed in the Homes' vault, and burial was in the spring, at the Home Cemetery. Another sad case was that of Moses Flanders, a soldier in Company C. 21st Massachusetts Infantry. Although he passed this life with natural cause, a note was made, " Body placed in vault hoping family would come for it". Word was never received from any relative, and he was buried in the Home Cemetery, where he will rest with many other old comrades. There are other similar stories recorded concerning the untimely deaths of a few of the residents, however there was much more good than bad. The trustees, along with the superintendent and matron, worked hard to keep various activities planned. Frequently local civic organizations, churches, and citizens in general, would furnish entertainment. The fall and winter holidays, as well as patriotic holidays were celebrated in style. Thanksgiving appeared to be a favorite for Governor Proctor. He created a tradition at the Home to make the day a joyous occasion, and he, as governor, and president of the trustees, financed the day from his personal resources. The dining hall was traditionally decorated, and a lovely five course meal was served, to residents and guests. Following dinner they all were invited to the smoking room, also beautifully decorated, to listen to an afternoon of seasonal and patriotic orchestra music. Christmas was also a joyous day. Decorations, including a large tree and lights, were trimmed by the matron, with assistance from the residents. Community organizations from the city, as well as organizations from throughout the state sent care packages, so all residents would have gifts. After a typical Christmas dinner, the afternoon was spent enjoying songs of the season presented by local bands. Decoration Day was truly a Red, White, And Blue Day; a day designated to honor all that gave the ultimate sacrifice in defense of our Union. It was a day of celebration and reflection. One can imagine that these "Old Soldiers" went to bed the night before in great anticipation, anxious for the day ahead. As soon as breakfast was behind them it was parade time in the city. All those that were able to march were invited to do so. The others gathered on the streets, very erect, with their hat in their left hand, and their right hand across their heart. No "Old Soldier" would allow a flag to pass them by without showing proper respect. The bands played marching tunes of the war era, without a doubt causing tears to flow. Cemeteries throughout the land had been decorated with flags and flowers. After the parade a memorial service was held at the Homes' cemetery. There was time to meander among the markers, and viewing the resting places of so many old comrades. A speaker was available, with a message and prayers, followed by The Pledge of Allegiance and Taps. Not a dry eye left the cemetery. Back at the Home a picnic lunch was waiting for them, to be enjoyed in the out of doors. Many visitors came to pay respect to those still with us. Members of the G.A.R., W.R.C., Sons of Vets., and many others mingled with the residents to reminisce, and bring good wishes. The day was priceless, and many men ended their day exhausted, but feeling very rewarded. The spirit of America reigned once again when Independence Day arrived. The order of the day was similar to Decoration Day, offering parades, music and picnics. Again, our men of the Civil War felt a "high", realizing they had fought to defend what their forefathers had fought so hard to achieve. July 4, 1905 was the dedication of the Soldiers Monument in Manchester. Under the auspicious of the G.A.R., it was a gay event to honor all war veterans of the Revolution, the War of 1812, the Mexican War, and the Civil War. Residents of the Home, that were able were invited, and enjoyed a very festive day. June, 1925, Annual Encampment of G.A.R. was in Bennington. A main feature of the gathering was a reception at the Home; more parades and music; a joyous occasion! Music was a great source of entertainment for soldiers serving, as well as a means to express their feelings of war, and the hopes to see home again. The tunes were carried home with them, and were used in years to come at patriotic events. Can I Go, Dearest Mother? Summer and fall months allowed a lot of outdoor activities for the residents of the Home. Fishing was a favorite to many. There were plenty of streams, brooks and rivers to cast their hooks from. Sitting on the banks, and experiencing the great outdoors, and the nature around them, undoubtedly, brought a sense of peace and serenity to them; catching a few trout or perch would have been a plus. One fishing expedition got a few old souls in a little trouble. After catching their limit they walked to town and sold their catch on the street. Innocent as it sounds, that wasn't acceptable to the rules of the Home. The theory for disallowing this was the idea, with extra money in their pockets, they may desire to use it for liquor, which was a definite no. The then superintendent, Col. Coffey, gave them a stern talking to, and without ramification, the event was dropped, After all, they were acting as little boys in an old man's body; it was fun, and would be a topic of conversation for some time to come. For those not interested in fishing or hunting, or weren't physically able to do so, there were beautiful landscaped grounds around the home, with benches to sit and enjoy the beauty and fresh air. During the late 1800's the Home maintained a menagerie of small animals, which included raccoons, foxes, an antlered deer, prairie dog, squirrels, woodchucks, monkeys, and a variety of birds. There was also a deer park that was occupied by a dozen or more native Vermont deer. This was a great attraction to the residents of the Home, as well as passers-by that stopped to view the sight. This likely provided much pleasure to the soldiers and visitors alike. The Board Of Trustees consisted of eighteen members including the President, Secretary, and Treasurer, a committee of finance consisting of five members, a committee on admissions consisting of three members, and three auditors. There was not to be more than eighteen members, and fifteen of them must be G.A.R. members. Requirements of admission to the Home varied from time to time, but certain criteria always remained in place; An honorably discharged veteran, a Vermont native, or one who took Vermont residency after the war, a veteran from another state that served in a Vermont unit, or a veteran with limited resources, or one needing the medical care the Home could offer. The farm was equipped with living quarters for farm hands and herdsmen. Livestock included about fifty head of cattle, pigs, hens, capons and turkeys. There were also four teams of work horses. The garden provided as many as twelve different vegetables. There were several acres of sturdy Maple trees on the property. Whether there was a sugaring operation is not known. Many meals were served with the products of this award winning farm. Operation of the farm was downsized in the late 1930's, and discontinued completely in 1960. One of the early trustees, Capt. Frank Kenfield, wore "many hats". His whole life was spent serving his county, state, and nation. In his personal life he was a very intensive farmer, and owned and operated a large sugar orchard, and served several years as president of the Maple Sugar Makers of Vermont. This could give credence to the fact that he likely saw to establishing a sugar operation at the Home. The last Civil War veteran to "cross-over" at the home was Moses J. Knapp. He was a native of West Haven, being born there in 1840. At the age of 20 he enlisted at Castleton as a musician in Company F, 14th Vermont. A second enlistment was with Company B, 186th New York. He resided in N.Y. for several years, but after the death of his wife in 1926 he returned to Vermont to locate near family. He entered the Home in 1928, and resided there until his death on September 10, 1934. His remains were removed to Dexter, N.Y. for burial. There were two Old Comrades that made their home at The Home for eighteen years. Lewis F. Crosier was from Halifax, Vt., and enlisted there in December of 1863, with the 4th Vermont Infantry, Company I, later transferred to Company F, and discharged in February of 1865.He died in 1916. Asher Baker served with the 27th Massachusetts Infantry, and died at the Home in 1926. Their burial locations are undetermined at this time. The original cemetery at the Soldiers Home was a one acre plot of land in the north-east part of the property, behind the buildings. This acre was reserved strictly for Civil War veterans that had lived at the Home, if they chose, but was eventually enlarged to seventeen acres, to accommodate veterans of other wars wanting to be interred there .Exactly when it was established is not certain. Some histories put it at 1884; however that was before the actual establishment of a Soldiers Home.1886 would be a more reasonable date. According to records there are 156 Civil War Veterans interred there, each grave being identified with a marker giving name, dates, and unit served. It closely resembles the layout of our National Cemeteries. Whole number admitted, 906, of whom 16 served in the Spanish American War, 1 in the Mexican War, 1 in the Indian Wars, and the remainder in the Civil War; Number known deaths 581; now on the rolls, 51; number discharged or dropped from rolls, 275. As there is no record kept of the latter, the number still living is problematical, but a conservative estimate is that 60% are dead, so it's probable that 720 of the 906 are dead. Of these 120 are buried in the Home cemetery. At the head of each grave is a modest, but tasteful, marble marker inscribed with the name, company and regiment, date of birth and death, In the cemetery the Memorial Day services have been held for many. Lieut. Joshua P. Sawyer, 2nd Vt., thought to be dead. The youngest Civil War Veteran now living at the Home is Lewis J. Blakely, nearly 74; the oldest is Martin S. Atwood, passed 90 years. The average of those now on the roll is 80. The deaths in 1919 were 10, in 1920, 15. Since January 1, sixteen have died, 12 in January, as follows: Henry L. Puffer, 8th Vt.; Jan. 12, William Burroughs, 17th Vt.; Jan. 13, Justin S. Hall, 13th U.S. Inf. ; Jan 15, Jerome B. Smith, 2nd Battery; Jan16, Peter O. Clark, 1st Vt. Cavalry; Jan. 17, Edmund Stone, 1st Vt. Cavalry; Jan. James Mossey, 3rd Vt.; John H. Leonard, 14th Vt.; Jan. 23, Anson M. Washburn, 1st Vt.; Jan 24, Charles H. Bly, 37th Mass. ; Jan 25, Lewis E. Parker, 9th Vt.; Jan. 21 Charles G. Smith, 1st Vt. (Spanish War); Jan 30, William Wilkens, 7th Vt. March 21, Royal F. Fassett, 11th Vt.; March 5, Charles A Phillips, 14th Vt.; April 26, Joseph Battles, 8th Mass., May 30. According to the reports of the Commissioner of Pensions, something like 25, 000 Civil War Veterans throughout the U.S. have died in the last year. This fact and those above, are grounds for the belief that ten years from now, not a single Civil War veteran will be living at the Home. (Comment - this assumption was grossly under estimated. Twenty-eight years later, in 1948, Henry Horton of the 2nd Vermont Infantry, died in Troy, New York. In 1956 Albert Woolson, a native of New York, and a member of the Minnesota Infantry, was the last of our country's Civil War Veterans to cross over. The end of the Civil War era at the Vermont Soldiers Home came at the death of Moses Knapp in 1934, at the age of 94. 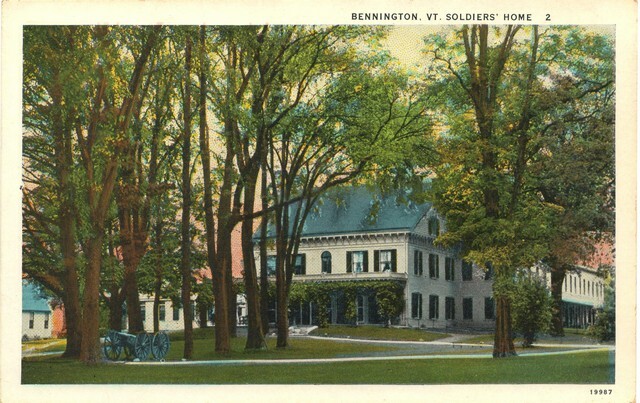 The Vermont Soldiers Home at Bennington carries on. Although the acreage is downsized, it still includes about seventy-five acres, with modern, up-to-date facilities, and serving Vermont veterans with the best of care and comfort. 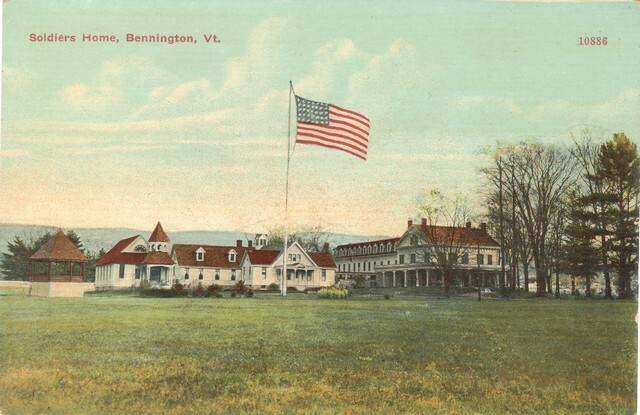 On April 14, 1971, the home was renamed the Vermont Veterans' Home. Researched and written by Deanna French.